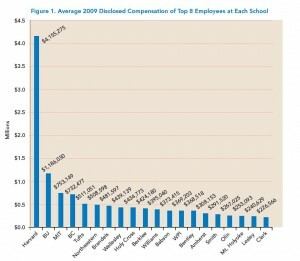 In the traditional academic workplace, compensation is set from top. That way resources get distributed fairly and institutional priorities can take precedence. 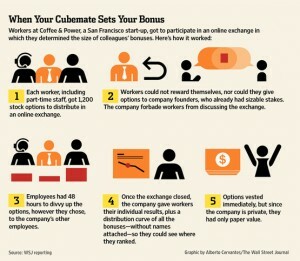 The Wall Street Journal is reporting about a new model for bonuses in which colleagues reward each other. As practiced at a coffee shop in San Francisco, employees receive a certain amount of shares that they can distribute to their coworkers, in essence voting for how much they value each other’s contributions. This model requires leadership to cede some control but can also bring to their attention the work of some less visible employees. If academic medicine is going to take the concept of collaboration seriously, peer bonuses are one way to recognize excellence in that area. Of course, tying teamwork to compensation is not the only way to do that. Praise comes in many forms. All clinicians are aware that much of the work they perform is not billable. The gap between effort and reward is particularly acute in primary care, where some doctors may be disinclined to accept complicated new patients because it could mean uncompensated work in coordinating care. At Brigham and Women’s and Massachusetts General Hospital, a new compensation system is being introduced to incentivize primary care physicians to accept new and complicated patients. Ten percent of a doctor’s salary will now be based on patient volume and complexity. The leaders of the plan admit that they have yet to refine measures of complexity, but they are optimistic that this plan will help meet the growing need for primary care services. The Center for Social Philanthropy has released a report on the most highly paid employees at Massachusetts’s private universities. As the figure shows, the average of the 8 top earners at Harvard far outpaced all other universities. The Harvard numbers, however, include salary for the investors who manage the endowment. Removing those outliers, Harvard comes closer to BU as the institution with the highest average top earners. The report points out that the outsized earnings came at the same time as the height of the financial crisis. At BU, the highest paid employees earn more than 17 times what the average faculty member earns. The Supreme Court heard arguments yesterday in a case with both financial and philosophical repercussions for medical schools. Employers and employees must pay a portion of their salaries to the federal government for Social Security and Medicare. Students working for the university while studying are exempt from the taxes. In 2005, the U.S. Treasury Department ruled that medical residents do not qualify for the exemption, which was intended to support students working part-time. Medical residents work full-time and then some, so the government reasoned that they should be treated as employees and subject to the tax. At stake is $700 million in additional revenue. The Mayo Foundation and the University of Minnesota appealed the decision, winning a round in court, but then a federal appeals court overturned the ruling. In appealing the case to the Supreme Court, the petitioners received friend of the court briefs from a consortium of academic medical centers including Boston Medical Center. They argue that residents are indeed students in that they attend classes, receive training, and learn about patient care. The Supreme Court did not seem to indicate its thinking. The debate reminds me of the conflict between universities and doctoral students over unionization. In the end, many graduate students made the case that they were both students and employees and won the right to unionize. Medical residents already belong to unions, so how does that complicate the question of whether they are students or employees? The number of primary care physicians in the United States is already too low to meet the demand. With the implementation of reforms to bring health care access to millions more, the shortage of PCPs will become even more acute. Time Magazine reported on this looming problem last week. Experts estimate that we will be short 30,000 primary care doctors by 2015. With fewer than 7% of current medical students interested in practicing general internal medicine or family medicine, the problem will only escalate. Like other media that report on the problem, Time blames the rise in debt that medical students accrue. Even though the average primary care physician can expect to make almost $200,000 a year, that is less than half what a cardiologist can earn and a small part of the $500,000 in loans that a student might have to repay. Money is no doubt a consideration for medical students choosing a specialty. I doubt many applicants for dermatology residency slots chose to pursue medical studies because of a passion to treat skin diseases. Rather, dermatology offers a higher pay with more control over schedules. For younger generations, practicing medicine should not be incompatible with building a life. The American Association of University Professors just released its annual survey of faculty salaries. The headline message is that average faculty salaries in the United States increased just 1.2% over the last year, the smallest jump in fifty years of tracking data. Breaking down the tables, it shows that at Boston University, the average full professor makes $140,600 a year, associate professors $95,500, and assistant professors $82,100. These figures include the schools of law, dentistry, engineering, business, and arts and sciences, though not the medical school. Still, the same trends in hiring freezes, furloughs, and budget cuts resonate in the academic medical environment.